In 1904, when a railway line was planned for Gstaad, Hans and Rosalie Reuteler understood that this little mountain village had the potential to become a sought after holiday destination. In 1910 the Park Hotel Reuteler opened its doors as the first five-star hotel in Gstaad. When the hotel first opened it had exceptional amenities for that era such as central heating, electricity and an elevator. Thanks to its unique location, the hotel quickly became popular with its guests and its early patrons included crowned heads as well as celebrated personalities from the worlds of business, art and literature. In 2006, the SPA was completely renovated and four years later, to mark the 100th anniversary of the hotel, the entire property was redecorated by interior designer Federica Palacios to create a luxurious setting combining modern design with the rich heritage of the hotel. 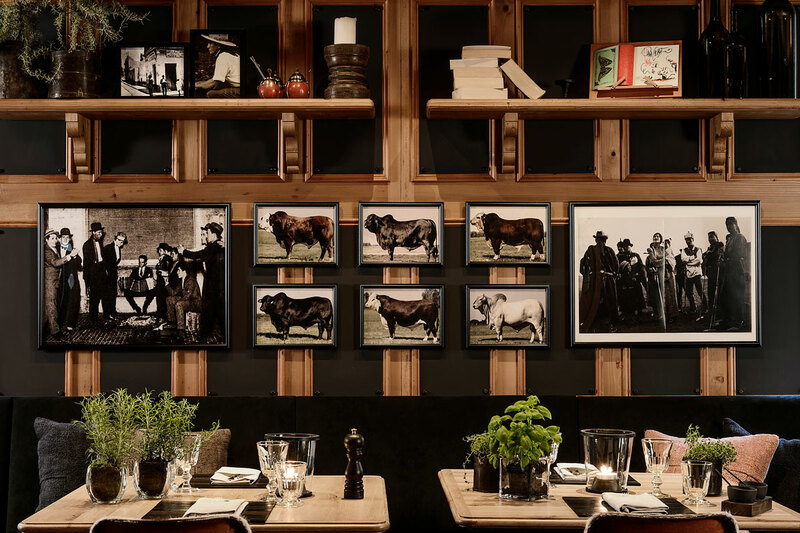 December 2015 marked the opening of Chubut Food & Fire Restaurant as well as the Club Bar. In 2017, the hotel opened Avenue Montagne, a contemporary restaurant serving indulgent and creative dishes, combining traditional and contemporary recipes. 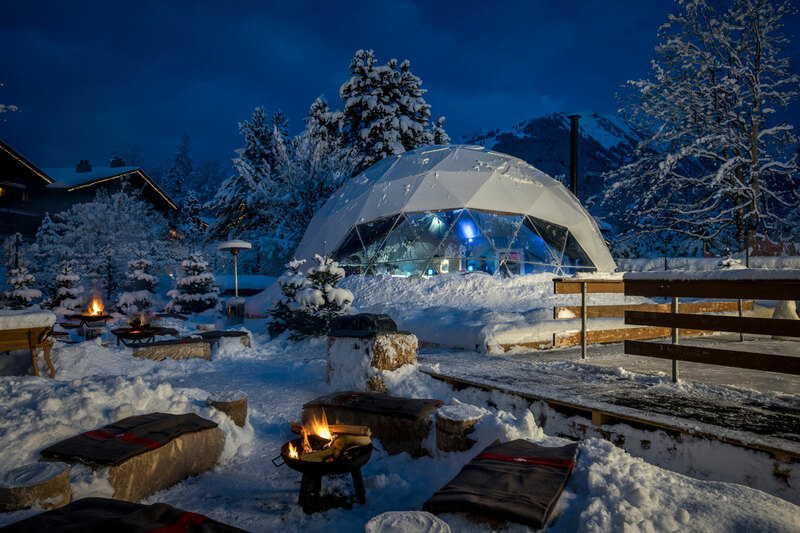 In December 2017, a new après ski is created: Ice Dome. 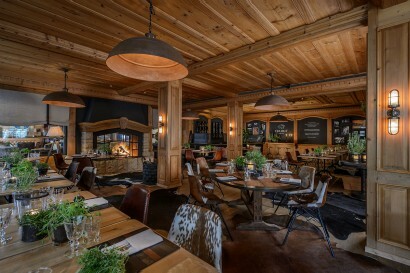 The hotel represents a unique combination of warm chalet style interiors with a modern finish. It offers guests exceptional experiences, like its restaurants and the Indoor Golf Simulator, with a warm and welcoming service that embodies Swiss hospitality. Located in the centre of Gstaad on an elevated hill, the hotel is 5 min walking from the famous Promenade and 2 mins driving from the mountain lifts Eggli & Wispile. It is thus ideally located to have short distances to main attractions whilst fully enjoying the beautiful mountain panorama.a. 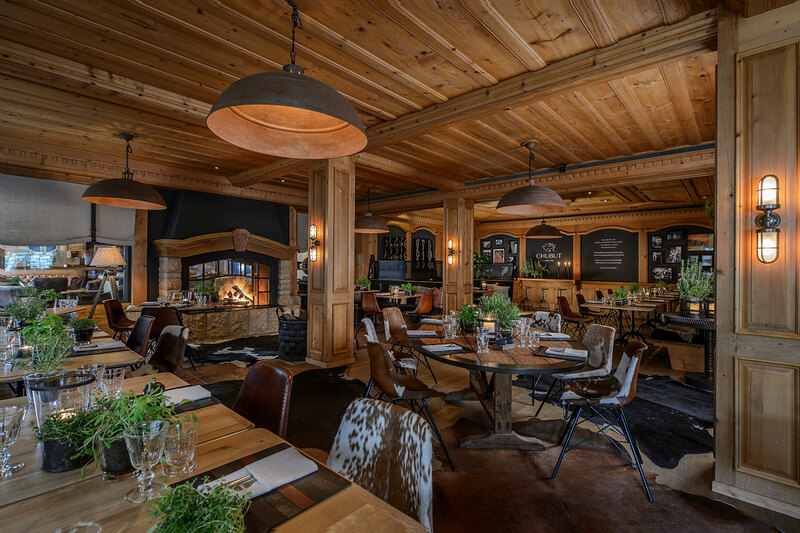 Key points of interest within a short distance from the hotel include the Promenade (shopping street with bars and restaurants), mountain lifts (hiking trails in summer and ski slopes in winter), cinema, Gstaad indoor public pool and sports center. The playroom for children includes entertainment games, board games, nannies on spot every day from 8am to 9pm (free of charge). A special menu for the youngest ones is available at our restaurants. Other activities such as ice-skating and pool are also available, and are not exclusively kids-only. 2 Executive suites: The Executive Suites are on 72 m2 (765 sq feet) and have a balcony. 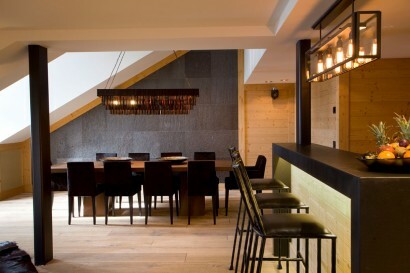 They consist of one separate bedroom, a living room and a dining area. Upon request, they can be connected to an additional bedroom. VIP treatment and special welcome amenities await the guests. The Executive Suites have a contemporary chalet style design with modern bath rooms in black granite, TV entertainment system (TV, radio and multimedia plugs), free wireless internet access, safe, minibar and portable telephones. 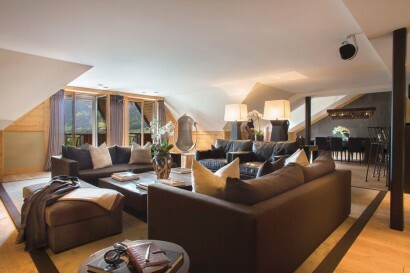 The Executive Penthouse Suite “The Indulgence” with a breathtaking view to the mountains. Situated on the two top floors of the hotel, the Executive Penthouse Suite “The Indulgence” on 125 m2 (1300 sq ft) is air-conditioned, has a balcony and consists of two separate bedrooms, a living room and a dining room. VIP treatment and special welcome amenities await the guests. 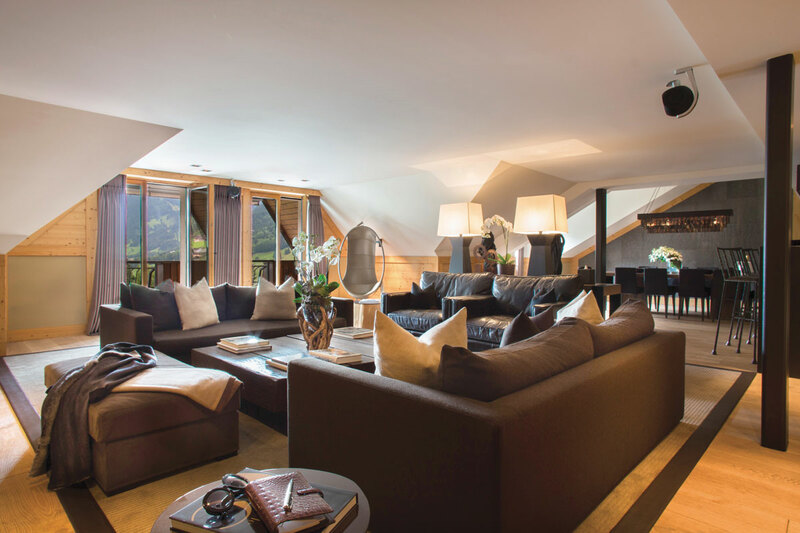 The Executive Penthouse Suite “The Indulgence” has a contemporary chalet style design with modern bath rooms in black granite, TV entertainment system (TV, radio and multimedia plugs), free wireless internet access, safe, minibar and portable telephones. Situated on the two top floors of the hotel, the Deluxe Penthouse Suite “The Promenade” on 215 m2 (2300 sq ft) is air-conditioned, has a balcony and consists of three separate bedrooms, a living room and a dining room. VIP treatment and special welcome amenities await the guests. The Deluxe Penthouse Suite “The Promenade” has a contemporary chalet style design with modern bath rooms in black granite, TV entertainment system (TV, radio and multimedia plugs), free wireless internet access, safe, minibar and portable telephones. Situated on the two top floors of the hotel, the Deluxe Penthouse Suite “The Park” on 215 m2 (2300 sq ft) is air-conditioned, has a balcony and consists of three separate bedrooms, a living room and a dining room. The Suite is also equipped with a Sauna and Steambath as well as a multifunctional treadmill. VIP treatment and special welcome amenities await the guests. The Deluxe Penthouse Suite “The Park” has a contemporary chalet style design with modern bath rooms in black granite, TV entertainment system (TV, radio and multimedia plugs), free wireless internet access, safe, minibar and portable telephones. 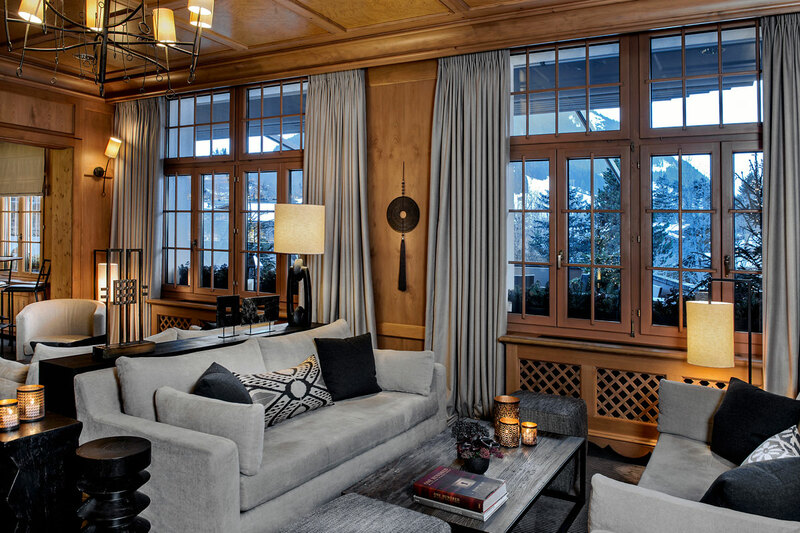 Situated on the two top floors of the hotel, the Presidential Suite “My Gstaad Chalet” on 400 m2 (4300 sq ft) is air-conditioned, has a balcony and consists of four separate bedrooms, a living room, a dining room, a kitchenette and a private Spa with sauna, steam bath, Jacuzzi, massage room and fully equipped gym. A private Butler is available 24 hours. VIP treatment and special welcome amenities await the guests. The Presidential Suite “My Gstaad Chalet” has a contemporary chalet style design with modern bath rooms in black granite, TV entertainment system (TV, radio and multimedia plugs), free wireless internet access, safe, minibar and portable telephones. 37 Deluxe Mountain view Rooms: The elegant rooms of around 40 sqm welcome our guests to a contemporary chalet style design with modern bath rooms in black granite, Bang & Olufsen TV entertainment system (TV, radio and multimedia plugs), free wireless internet access, safe, minibar and portable telephone as well as Aromatherapy Associates Amenities. 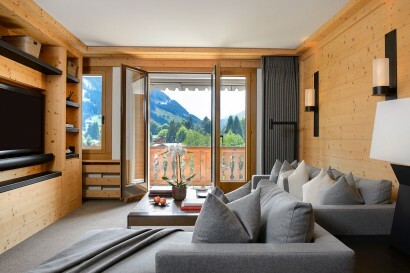 All rooms feature splendid Mountain views and have balconies or terraces. 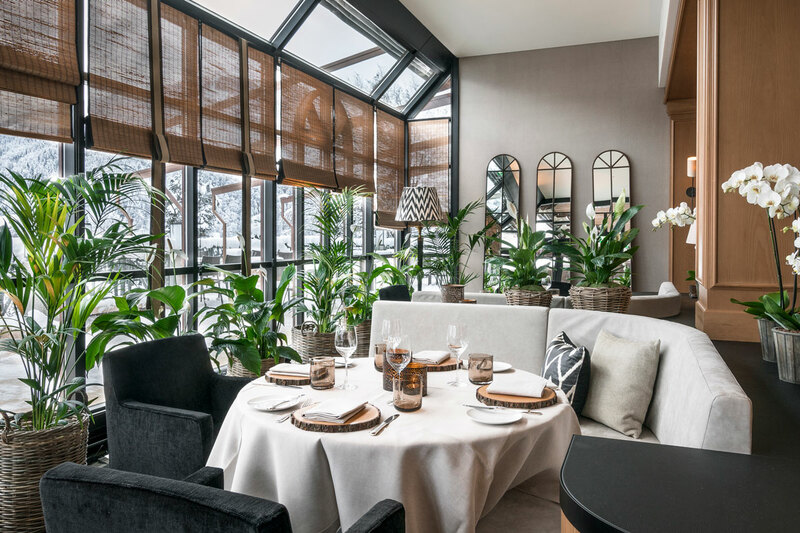 Avenue Montagne: The restaurant Avenue Montagne and its lounge have been completely refurbished for the 2017-2018 winter season. Sustainability is at the heart of the restaurant’s cuisine and a true connection to nature runs through every dish. Discover honest Alpine food packed with flavor at Avenue Montagne managed by our Chef Axel Rüdlin, awarded Chef of Year 2017. Chubut: A unique ‘Food & Fire’ culinary concept inspired by the Chubut province of Patagonian Argentina. Known as the ‘land of fire and living wind,’ Chubut’s offerings are a masterful blend of taste and texture. The simple but effective cooking style ensures the ingredients are the main characters of every dish with the meats skillfully prepared using different facets of the fire. Bar: Cozy atmosphere around the long bar dressed in leather or near the design fireplace serving cocktails, snacks and freshly prepared sushis throughout the day. Live music, DJ entertainment every night. Caveau: The Caveau is the sommelier’s domain, where a dozen guests can enjoy a unique and convivial moment as they discover and taste the wonderful offerings on the wine menu paired with regional meat and cheese specialties. 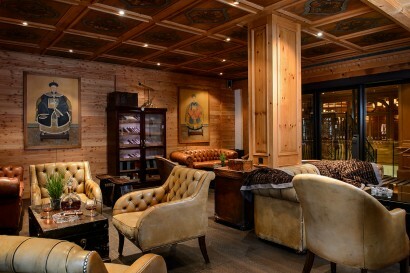 Cigar Lounge: In an intimate setting reminiscent of a British club, featuring Chesterfield armchairs, a humidor, narghiles with enthralling scents and a selection of prestigious alcohols, one would like time to stop. Ice Dome: Whether you’re relaxing on a hay bale by the warming fire pits or enjoying a cotton candy with the kids after a skate, the Ice Dome will surprise and delight all the family. Ice skating, champagne, DJ and a warm fire, discover our new Ice Dome! Open to all, join us for a skate before cosying up inside the dome to indulge in Laurent Perrier Champagne, glühwein and hot chocolate. The Spa : Situated at its heart, there is a large indoor salt-water swimming pool heated to 32° C and in the summer, the outdoor pool opens giving guests the opportunity to swim amidst the garden, facing breath- taking alpine views. Guests can enjoy the hotel’s Jacuzzi, Turkish baths and saunas, benefiting from both their relaxing and purifying effects. The gym is home to top of the range fitness equipment and a world-class personal trainer.Is a unique and luxurious place to visit for those who wish to soothe the mind and soul, relax recuperate and leave feeling rejuvenated. It offers hotel guests an extensive treatment menu to include massages, facials, hydrotherapy and balneotherapy. Aromatherapy Associates have been at the forefront of aromatherapy for over 30 years. Their essential oils, with unique and recognisable aromas, are highly effective in enhancing physical, mental and emotional wellbeing. Aromatherapy Associates. Created by Dr. Jurgen Klein, JK7’s high performance products are 100% natural based, utilising expertly formulated herbal compounds to deliver maximum benefit for the user’s skin and overall health. No matter what your level of fitness is, Park Gstaad’s resident personal trainer will help you achieve your goals. 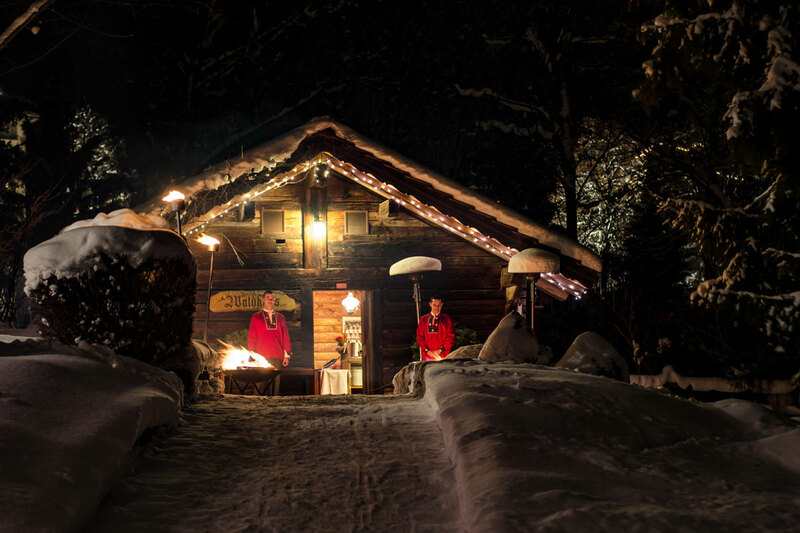 From our beautiful gym equipped with the latest Technogym machines to the great outdoors, Park Gstaad provides the perfect environment for an active holiday. Available in a designated space at the heart of the hotel, the Gstaad Indoor Golf Club houses a state of the art PGA Tour SimSurround simulator with curved screen giving golfers access to the most beautiful golf courses in the world. Facilitated by a Pro to give advice and private lessons, the simulator is the ideal environment to analyze swing technique. All the equipment can be rented directly at the hotel. The hotel houses six designated areas ideal for successful board meetings, conferences or team building initiatives. In a region rich in outdoor activities, each event can be tailor made to include unique offerings such as rafting, igloo building and cheese making. 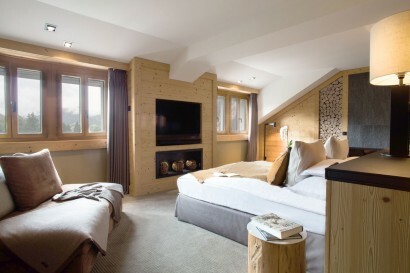 The Park Gstaad places the expertise of its entire team at the disposal of its guests. Other rooms include Salon Bridge & Business Corner (max 12 pax respectively) and Library Lounge. 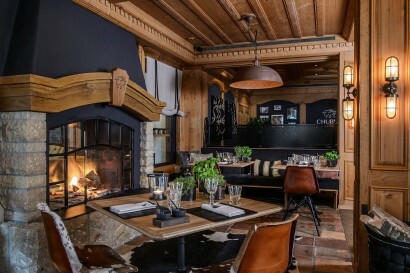 Chalet Waldhuus: Nestled in the hotel’s garden, this cosy wooden chalet offers delicious local specialities in Swiss rustic mountain atmosphere. A wide selection of fondues and raclettes are available for an authentic culinary experience. One Golf pro on spot to keep on training. Either with our Indoor Golf Simulator or outdoor. At 2 minutes from ski area. Cooking classes with our Chef, Sushi classes with our sushi masters, pilates, yoga and fitness trainings with our coach.